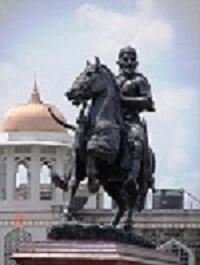 Shivaji University is named after the great Maratha warrior Chhatrapati Shivaji Maharaj. So it’s our prime duty to provide all the literature about Chatrapati Shivaji Maharaj. Barr. Balasaheb Khardekar Knowledge Resource Center has taken project of compilation of the online literature on Chhatrapati Shivaji Maharaj and made available on the BBK KRC portal on this occasion of 56th foundation day of the Shivaji University. I hope it will be very beneficial for the knowledge stakeholders from all over the World. My best wishes for this project. The Barr. Balasaheb Kharadekar Knowledge Resource Center, Shivaji University is one of the leading university libraries in Southern Maharashtra, India. The mission of the Library is “To actively support the teaching, learning and research activities of the university by providing the access to the information sources for study, teaching and research”. Shivaji University is named after the great Maratha warrior Chhatrapati Shivaji Maharaj so it is the great pleasure for the Barr. Balasaheb Kharadekar Knowledge Resource Center to compile the literature on Chhatrapati Shivaji Maharaj, on the auspicious occasion of 56th foundation day of the university and made available on the BBK KRC portal. Several reference tools such as multimedia references, thesis/dissertations, bibliography of print materials and online e-resources are consulted while compiling this task. The portal is developed with searchable metadata for easy access to all stake holders globally. It is an appeal to one and all to browse this documentary and submit the literature on Chhatrapati Shivaji Maharaj if available with them in any format that will be additional input to us. For this you may contact to Director, Barr. Balasaheb Kharadekar Knowledge Resource Center at the e-mail address- nbk.ul@unishivaji.ac.in , M-09890070404, office number-0231-2609204.